Selling Your Gift Cards – How can we help? Note: You do not need to prepopulate Vend with your Gift Card codes. You will input your unique Gift Card codes when you come to sell the Gift Card to your customer. For more information on how this works, follow the steps below. To sell a gift card, go to the sell screen and bring up the Gift Card product in the search. 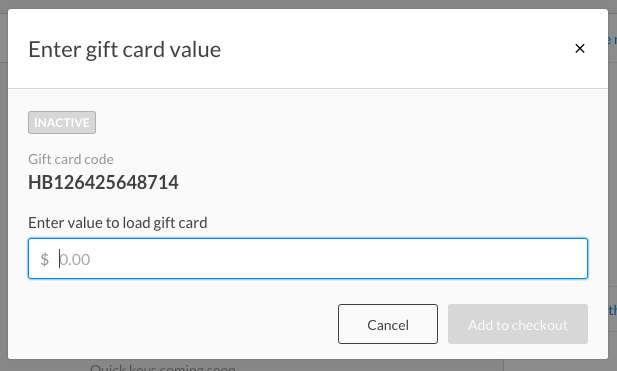 If you are using Vend on iPad and think you will sell gift cards often, you can set them up as a quick key for easy access. To learn how to create quick keys head over to this article here. Once you select the Gift Card product, a verification box will appear. This box will prompt you to input or scan the unique code on your physical gift card and verify this number. Note: If you scan in a gift card code that's already been activated you will receive a notification letting you know the current active balance of this card and an option to scan in a new code. Once the code has been verified, enter the gift card value and click Add to Checkout. The gift card is now added to the sale! You can finish this sale as per usual to complete the process. Note: Tax will not be charged on the gift card until the value is redeemed.